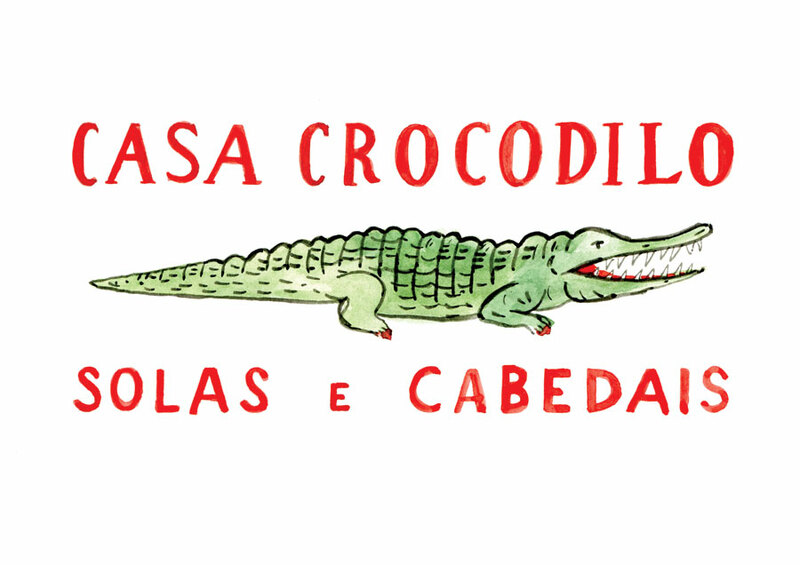 As the icy fingers of the Berlin winter started to tighten their chilly grip, French illustrator Laura Junger and a friend travelled to Portugal to escape the encroaching darkness. 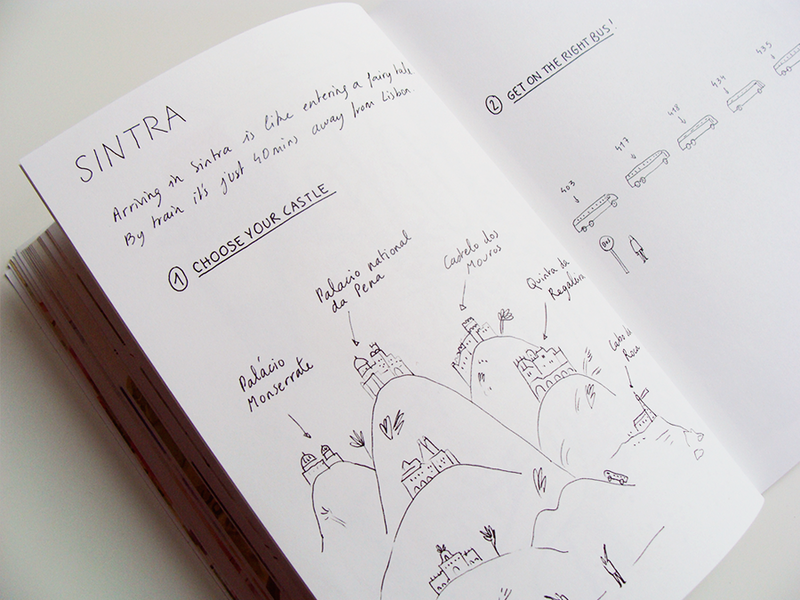 Opening with a black ink line drawing of a map of Portugal complete with palm trees and surfers, Laura’s beautiful self-published book follows their two-month journey in Lisbon and Porto. 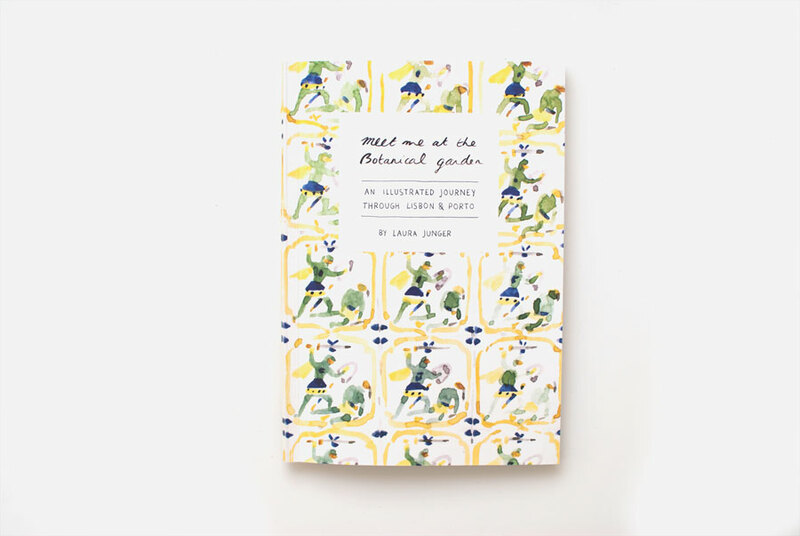 Meet me at the Botanical garden is a mix of colourful watercolour illustrations interspersed with black line drawings, simple maps and lighthearted text. Laura’s charming handwritten notes on her favourite Pastel de Nata (in Belém! ), how to plan a trip to the castles of Sintra, and a map to the Atlantic Ocean allow you to adventure alongside her and are key to making the book feel personal. 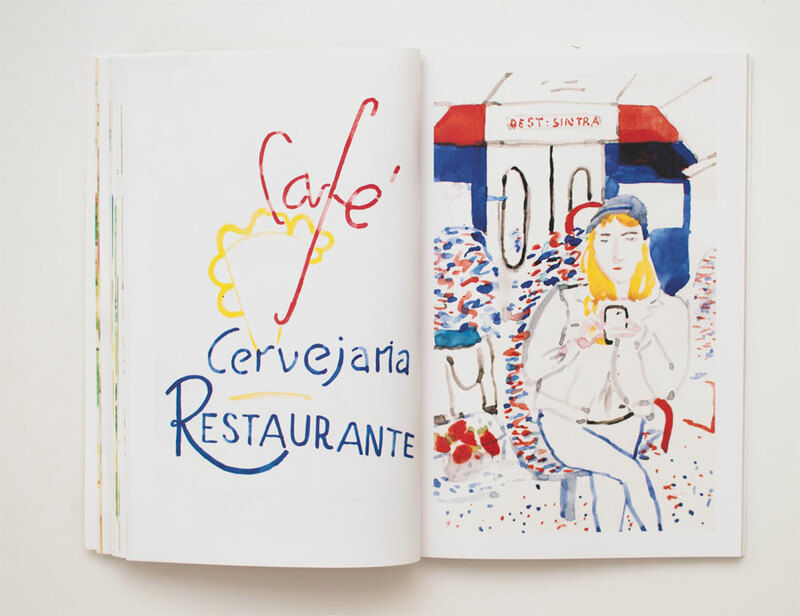 The illustrations take you on a journey around the cities; visiting palace gardens, apartment buildings, beaches, or observing people sitting at cafes. You can imagine Laura wandering Lisbon like an 18th Century picturesque tourist, a box of watercolours under her arm. The scratchy drawings feel as if you are peeking over her shoulder as she sketches the view. The element of chance in working with watercolours is both exciting and challenging. Included in the book are a number of images created purely in watercolour, and many others that also include sketchy black ink lines. The lines help to loosely guide the illustrations, giving the watercolour shape, taming mistakes, shaping figures, and adding details to trees or buildings. The lines are particularly enticing when they are used in depicting people and statues. Simple strokes, strikes, dashes and swirls define facial features and figures: single lines for noses, eyes, hair, chins. The figures bring to mind the character-filled illustrations by Quentin Blake, and as in his work, you can read the personalities in the simplest of gestures. 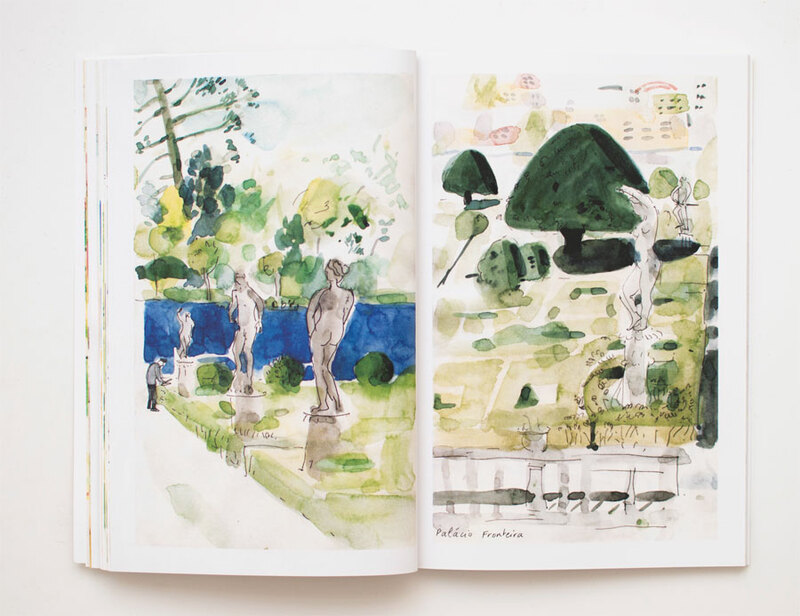 One of the most playful pure watercolour illustrations is the double-page-spread of the eponymous botanic garden. Here nature is abstract; light-green strokes tangle with darker-green splotches. Variations of green paint infer a variety of trees and leaves. Her playful brushstrokes give a sense of freshness, as if the garden is bursting with life. In the illustration of the Miradoura da Graça I kept coming back to a quiet section of the background. The evening glow of sunset is a subtle blended wash of paint; from dusky pink to light mustard yellow to sky blue. The simplicity of it is softly engaging. Laura’s looser observational landscapes and portraits contrast refreshingly with pages of precisely painted typography and signage. Two major design decisions give the book a feeling of lightness. Firstly, pages that include hand-written text, line-drawings or signage are given plenty of space on the white pages, giving breathing-room to the other pages bursting with watercolours. Another decision was to frame single portrait-oriented images with a paper-white border (landscape-oriented illustrations are presented as double-page-spreads and are printed right to the edge of the page). The use of a border gives equal importance to each image, and means they can be read together as pairs, or as individual works. One harmonious pair are portraits of women in the Mercado do Bolhão. On the left, a woman in the cafe is painted with intimacy and softness; colours are muted. The fishmonger opposite is vibrant, but the woman’s facial expression is quietly pensive. Both women look to their left, which creates a connection between their figures, and guides the viewer to turn the page. As the book comes to close, so does Laura’s journey in Portugal. For the last few pages the drawings have darker colours and fading light becomes a feature. 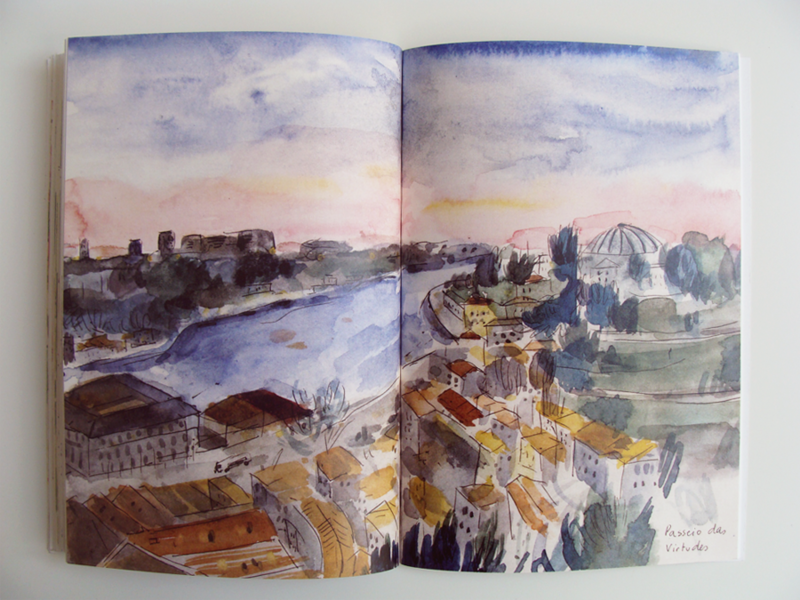 An illustration looking out over the River Douro from Passeio das Virtudes is full of sunset-pink skies and dark blues and greens. A portrait of Laura’s travel companion, Heather, is moody and subtle, with satisfyingly inky shadows. 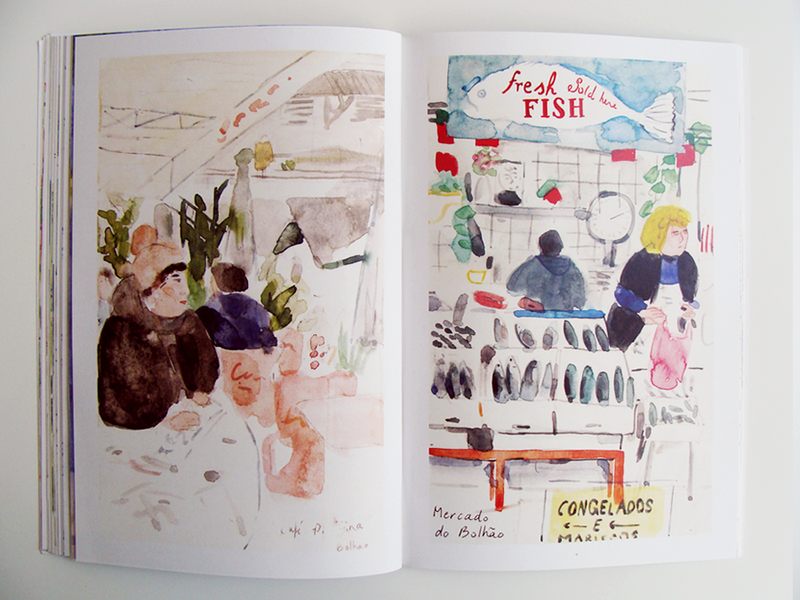 After arriving back in Berlin, it seems natural to me that Laura created a book from her illustrations. Travel illustration is a popular medium, and the web means that there is a broader audience for self-initiated work. Through self-publishing it is becoming ever easier to be self-determined as an illustrator, but the challenges remain. Self-publishing takes money, time and energy, not only to design and print the book, but also to promote your work. If this book had been planned through a traditional publisher, I feel like a few things would be different. It would have likely included sponsored recommendations, and over-used touristic imagery, such as the old yellow trams, or Lisbon’s Castelo de São Jorge. But Meet me at the Botanical garden feels local, and celebrates the variety of green spaces in Lisbon and Porto. The charm of this book comes from the personal details, like the observations on orange food, or ‘the boys’. In the corners of the illustrations, small jotted-down names of the drawing’s subject remind you of Laura’s presence there. The very nature of it being self-published, and having to email the author to buy a copy, makes the book feel special and something to value – something that would be lost on a larger scale. Self-published. Edition of 48. Watercolor book, 86 pages, A5.